This section contains settings for clouds. Toggles rendering of clouds on and off. Visual difference between low and ultra quality is not significant. Therefore, it is recommended to use low settings, when possible, to gain performance. This parameter has a significant impact on performance. Therefore, it is recommended to use low settings, when possible. The maximum length of a sun ray traced inside a cloud, in units. 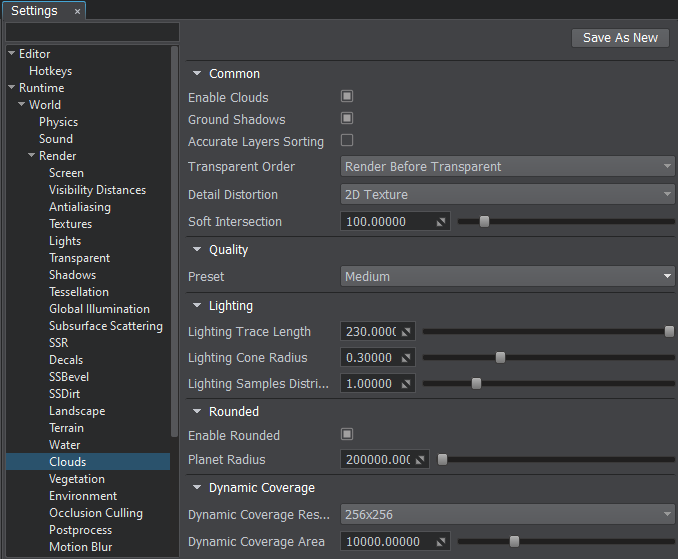 Lighting cone sampling radius for clouds lighting. Low values may result in unnatural behavior as the position of the sun changes. Visibility distance for coverage of FieldWeather objects, in units. In UnigineEditor this area is marked with a bounding box. When the camera is outside this box, the FieldWeather coverage is not visible. Increasing dynamic coverage area leads to reduction of quality of FieldWeather coverage texture and loss of details. This effect can be mitigated by increasing dynamic coverage resolution. Higher values make it possible to preserve texture details at high distances. Increased resolution significantly affects performance. When clouds are viewed from the ground or from above (at significant distance) and the viewer's velocity is less than 200 units per second, enabling this parameter can provide a significant gain in performance. This parameter has a significant impact on performance. Soft intersection distance for clouds, in meters. Toggles rendering of clouds shadows on the ground on and off. Toggles rendering of shadow shafts for clouds on and off. This parameter enables rendering of clouds after all transparent objects (except water). Toggles simplified depth test for clouds on and off. The amount of jitter in areas within clouds that is used to reduce banding effect due to an insufficient number of steps. The amount of jitter used to reduce banding effect due to insufficient number of steps. The amount of jitter for tracing steps of lighting calculation, which is used to reduce banding effect due to insufficient number of steps. The amount of jitter in areas between clouds, which is used to reduce banding effect due to insufficient number of steps.